A N N O U N C E M E N T ! 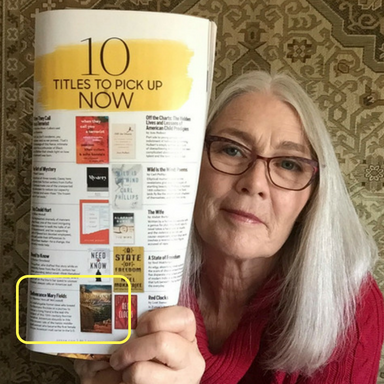 A new companion book to Deliverance Mary Fields coming out soon! A compilation of documents, photographs, diaries and other records discovered during the research for Deliverance Mary Fields and an expository essay about social and political events in 19th and early 20th century Montana and the nation. Created in response to reader requests— Thank you! A GREAT HONOR - Many Thanks! Please join my mailing list and be eligible for updates, discounts, & free advance copies for new books! The photo of Mary Fields (left) was taken circa 1895. I took the photo of the mission in the Birdtail in 2006.This building is all that is left of the Ursuline Mission at Saint Peter's Mission (the original log building). The Ursuline Saint Angela's Academy and boarding houses burned down circa 1911. This structure, the original cabin and chapel, was built by the Jesuits in 1864 and sold to the Ursulines in 1884. When the cadre of nuns arrived in the winter of 1884, snow and wind blew through deteriorated broken chinking between the logs. The Ursulines nearly froze to death and often suffered from frostbit limbs during the winter prior to Mary Fields' arrival. These geological wonders erupt above an otherwise flat prairie that stretches beyond sight, from the Rocky Mountains to the Missouri River. On the left is "Birdtail Rock" at one-thousand feet high; in the center is Square Butte and to the right is "Haystack Butte". Birdtail Rock is referenced often in Deliverance Mary Fields. A quote from the book's Prologue describes: "Eastern rocky mountain slopes stretched downward to hills and prairies cut by scant numbers of archetypal anomalies left behind: steep, molar-shaped buttes and elevated arrangements of statuesque stone - pillars that mystified and compassed direction - one in particular that inadvertently inspired a name for itself and the region surrounding its thousand-foot-high summit: Birdtail Rock and The Birdtail, respectively." The Montana Territory joined the Union, thus becoming a state, in 1889. A pioneer on the Montana frontier since 1885, Mary Fields moved from a remote area of The Birdtail to the small town of Cascade in 1894. The photo on the left shows Mary in Cascade. 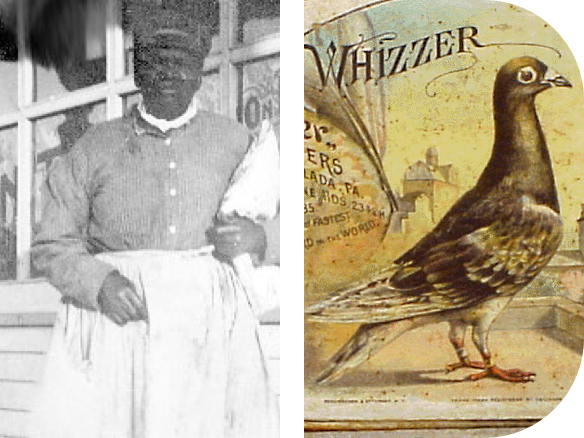 Deliverance Mary Fields readers will recognize the image on the right - Whizzer the Homing Pigeon, illustrated on a cigar box that served as Mary's cash box from 1894 to 1895 when she owned and operated "Mary's Cafe", a going Cascade concern. "It is the Ursuline calling to educate young women of any color so that they may become women trained to fill, acceptably, any station in life." A small cadre of Ursuline nuns volunteered to establish a school to protect Native American girls from being sold, raped or murdered on the reservations. Their leader, Mother Superior Mary Amadeus, a friend of Mary Fields, negotiated the purchase of two-hundred wilderness acres from the Jesuit missionaries who had come to the frontier earlier. Conditions of the structures were not what they had expected, nor were they aware how much physical labor they would be obligated to provide for the Jesuit priests and the populous of Native American boys. They persevered to accomplish their commitments. "She did whatever we couldn't," recounted one of the Ursuline nuns at the mission. for nine years Mary Fields labored to provide food and adequate living quarters for the nuns and the boarders: Native American and White girls who attended the segregated schools established by the sisters. Mary freighted crucial equipment, building supplies and passengers to and from the mission to the nearest settlement, seventeen miles each way, through perilous weather and formidable dangers for nine years. She built and operated a hennery consisting of over four-hundred hens and ducks and planted acres of vegetables each spring. When she arrived in 1885, there were less than a dozen persons. Years later, over two-hundred boarders lived on the property and attended Saint Angela's Academy. This photograph was taken circa 1894. The impressive, three-story structure on the right is the Ursuline Saint Angela's Academy, built from donations raised by Mother Mary Amadeus over a ten year period. Amadeus fund-raised at functions across the Midwest, East Coast and in Europe. She was most indebted to a wealthy patron, Miss Katharine Drexel, and to Mary Fields, who transported building supplies to the remote wilderness location. It appears that the pupils and their teachers are taking a break from rigorous academic and labor schedules on a beautiful summer day. "Mary Fields was six feet tall, over two-hundred pounds, and a match for any two men in the Montana Territory" Really? This preamble voiced by generations of regional Birdtail residents still resonates today. Historically, these words were the ones most often used to describe the region's legendary African American was addressed. Judging by the heights of members of the Cascade Cubs Baseball Team pictured here, would you wager that Mary Fields is six feet tall or over two-hundred pounds? I wouldn't. She might be a match for any two men in Montana, however. It was precisely this kind of rhetoric that prompted me to spend years of research in search of the true life story of this remarkable courageous pioneer. It was worth it. As I suspected, her real story was more amazing and remarkable than the fictional exaggerations - meager attempts to describe the entrepreneur's innate intelligence and learned attributes.